I'm reading Singer of Strange songs soon. I'll give my opnion on that if its wanted. There is allways the Bloch Mystries of the Worm from Chaosium as well. I heard they were printing a new edition a time ago but it appears to have vanished from view. Robert M. Price recently posted the table of contents of The Yog-Sothoth Cycle on Facebook. Still no release date, but the book is where it has been for the past 15 years (with Chaosium). Ramsey Campbell, "The Church in High Street"
Stephen Mark Rainey, "The Threshold of Beyond"
Robert Bloch, "The Ultimate Ultimatum"
Richard L. Tierney, "Lords of Pain"
Eric J. Miller, "The Gates of Perception"
Edward Lee, "The Deviltry of Elemental Valence"
David Langford, "Out of Space, out of Time"
It would be good to see The Winds of Zarr back in print. I found the Chaosium fiction books I've read so far to be entertaining enough. But, I think the overall most rewarding "Cthulhu fiction" I've read, aside from Lovecraft's original fiction, has been in the form of collections of (generally older) fiction that Lovecraft admired or was at least partly inspired by - such as Dunsany (I would still love to see a nice Dunsany collection that includes the original Simes illustrations! ), Poe, Blackwood, Machen, Hodgson, E.R. Burroughs, Robert E. Howard, Clark Ashton Smith, etc. I wouldn't mind seeing Chaosium produce a series of books collecting the "Weirdest" of this fiction, perhaps with commentary from Lovecraft (from his letters and essays) and other writers, presenting the collections from a "Lovecraftian" perspective. With that in mind, I thought Chaosium's The Terror and Other Stories (Machen), The White People and Other Stories (Machen), The Three Imposters and Other Stories (Machen), and The Yellow Sign and Other Stories (RW Chambers, a sort of "Best of" The King in Yellow, which in turn seems to be a sort of "Best of" Chambers) were quite excellent, and I'd recommend them all in a heartbeat to those who enjoy Lovecraft's fiction. E-mail Chaosium and tell them so. Part of Price's reason for posting this ToC (and that of The Yig Cycle) was that he wanted his FB friends to tell Chaosium that they want these books. I can see why they did it, since everyone who would buy a collection like that would have already read them, but I'm a little surprised that the The Yog-Sothoth Cycle doesn't include any of the Lovecraft stories in which Yog-Sothoth plays a major role, like "The Dunwich Horror" and "Through the Gates of the Silver Key." "The Dunwich Horror" was already included in The Dunwich Cycle, and "Through the Gates of the Silver Key"... well, it's certainly an unusual appearance by Yog-Sothoth. I have a few of these books that I've picked up from used bookshops and online retailers, but have only sat down and read the Shub-Niggurath one. Which I overall enjoyed, going from a couple pre-HPL goat devil stories, a Ramsey Campbell story or two, and a pleasantly fun historical pulp story by Richard L. Tierney. One of the stories by Robert M. Price genuinely made me shudder at its conclusion. A few of the others I got include a collection of Robert Bloch stories, the Nyarlathotep Cycle, Innsmouth Cycle, and I think Disciples of Cthulhu. No opinions of them yet, other than the HPL stories I've already read in a couple of them. Personally, I liked the style they used for their covers originally. I understand they changed to their second style because the first was considered off-putting to potential customers. The covers were black and text heavy (lists of the included authors) and the cover art was a small portrait (usually of the book's associated entity) against the black background. They also stopped putting the book number on the spine, which I also miss. Those are my thoughts as well. The original covers were more aesthetically pleasing and classier. I was not pleased by the covers done by "Fassl". Not disturbing/spooky, often not particularly related to the contents and, sometimes, flat-out revolting. This time of the year, late fall/early winter, I like to read "Ithaqua". I recently picked up a copy of the Antarktos Cycle from a used bookstore. I wanted to read "The Greatest Adventure" as a few characters from it were put in the sourcebook I've been using for my campaign. I got to say that it is, quite frankly, very shoddily edited. At least this particular story is. There are consistent and repeated typos throughout, particularly the word "had" being replaced with "bad", clearly a find-and-replace error. And a few cases where a random symbol has been added into a word, such as "expec<ation". Thinking back on a few other books in the series I've read, I realise now that Price didn't do much proofreading of the stories before sending them to print. Between that and the attitudes of many of the characters being depicted as huge jerks (and not just for the reasons you come to expect from 20's-30's pulp stories), it's really putting me off the story. I'd say typical OCR error. "had" for "bad" (and vice versa), "comer" for "corner", etc. is what you get when you scan a book page, run the image through a character recognition program to turn it into text -- and then cannot be bothered to proofread. (I have had OCR programs come up with some really imaginative interpretations, on the magnitude of "roadway" for "Napoleon".) And The Antarktos Cycle is by far the worst-proofed book in the Cthulhu Fiction line that I have encountered so far; it is not just this story, it is the entire book (I have checked the second edition as well, and it appears that these problems were not corrected there either). That said, I rather enjoyed "The Greatest Adventure". It is pulpishly silly, IMO, but entertaining. I would still love to see a nice Dunsany collection that includes the original Simes illustrations! You might be interested in The Book of Wonder & The Last Book of Wonder, which reproduces two of Dunsany's early collections along with the original Sime illustrations. It's a trade paperback, though, so may not fit every definition of "nice". I also have a Dover edition of The Sword of Welleran and Other Stories with the Sime illustrations; and the same caveat. I’d say typical OCR error. "had" for "bad" (and vice versa), "comer" for "corner", etc. is what you get when you scan a book page, run the image through a character recognition program to turn it into text -- and then cannot be bothered to proofread. (I have had OCR programs come up with some really imaginative interpretations, on the magnitude of "roadway" for "Napoleon".) And The Antarktos Cycle is by far the worst-proofed book in the Cthulhu Fiction line that I have encountered so far; it is not just this story, it is the entire book (I have checked the second edition as well, and it appears that these problems were not corrected there either). It's not that bad, I'm starting to get into the part where they're in Antartica and seeing some of the monsters, so definitely getting interesting. But the repeated typos are definitely off-putting for me. Too bad that it's the case with the rest of the book, as it looks to be a collection of longer stories. I've found that a lot of early Chaosium fiction was riddled with typos. It put me off buying them. Nothing like a howling error to pull one from the text. But maybe it's not just Chaosium; I've been reading a lot of Lovecraftian/weird fiction lately and pretty much every collection could do with some careful proof-reading. One (Hive by Tim Curran) even managed to have a typo in the blurb. You're not wrong. I bought a copy of Horror From The Hills, and I'm pretty sure it was made as cheaply as physically possible, and again riddled with typos. 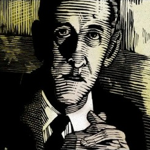 HPL seems to be spared this for the most part, though likely because he's since gained enough recognition to be considered literary. And naturally, if you consider the source of all these stories, and much as I love pulps, they were a very cheap media by design. I somehow missed this when you posted it - thank you for this! I was kind of looking for a fancier hardback book, but even a paperback is a step in the right direction, and it gives me the hope that, if the interest is there, something bigger might be in the works eventually.